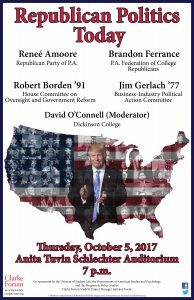 Drawing from state and national politics, this panel will explore who identifies as and what it means to be a Republican today. Particular attention will be paid to the definitions of conservatism and the challenges Republicans face in Pennsylvania as a swing state, adding context to political debates on Dickinson’s campus. This program is sponsored by the Clarke Forum for Contemporary Issues and co-sponsored by the Division of Student Life, the Departments of American Studies and Psychology and the Program in Policy Studies. This program was also initiated by the Clarke Forum Student Project Managers. Reneé Amoore is a longtime advocate of clinically-appropriate and cost effective alternatives to expensive healthcare, and began her foray into the medical field as a registered nurse with training at Harlem Hospital School of Nursing. 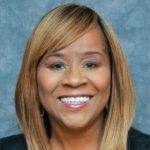 Earning her bachelor’s and master’s degrees from Antioch University, Amoore catapulted from a career in nursing, to supervisor of a hospital program, and VP and COO of a social service organization. In 1996 Amoore started her own company, which today consists of three divisions under the parent corporation, The Amoore Group (TAG). The divisions of TAG provide diverse services, such as: PR/ marketing, government relations, health care consulting, job creation, education, workplace diversity, and early intervention/allied health services. An active participant in shaping her community, Amoore was the first African American elected to the Upper Merion School District, where she served as the board’s vice president for four years. In 1992, she was elected to Pennsylvania’s Republican State Committee and became its deputy chair in 1996. In 2004 she became the first female and African American to chair a Pennsylvania delegation to the Republican National Convention. She also did role call at the 2000 Republican National Convention. At the 2008 Republican National Convention she was a keynote speaker. She has raised money for national, state and local candidates for the Republican Party. She is a Republican strategist for Fox News, CNN and local Philadelphia stations. She currently has a radio show, “Real Clear”. She is also currently involved with the Greater Philadelphia Chamber of Commerce, the Chamber Executive Committee, CMS, Women Against MS, Take the Lead Event Committee, Vision 2020, and the Pennsylvania New Majority Council, while also serving as a Drexel University trustee, a member of Drexel University’s executive board, member of the Main Line board of governors, Main Line Health, member of the Urban Affairs Coalition and the chair of the Joint Board at Saints Memorial Baptist Church. The Elevator of Achievement: Determination Requires a Choice, is a book written by Amoore in which she demonstrates how women can move up the corporate ladder by shaping their own attitudes about success, prejudice, oppression, equality, business, and leadership. Robert Borden ’91 is the deputy staff director of the House Committee on Oversight and Government Reform under Chairman Trey Gowdy. He has served on Capitol Hill for more than 20 years. He was the director of oversight for Speaker John Boehner and Majority Leaders Eric Cantor and Kevin McCarthy. In that capacity, he coordinated the oversight and investigative activities of House committees. 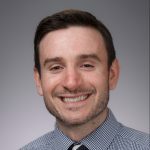 Borden has also served as the general counsel of the Committee on Oversight and Government Reform and before that the House Committee on Education and the Workforce. In addition, he served as counsel to the select committees that investigated the Benghazi terrorist attacks and the response to Hurricane Katrina. Borden graduated from Dickinson College in 1991 and from American University’s Washington College of Law in 1994. He lives in Northern Virginia with his wife and his two daughters. 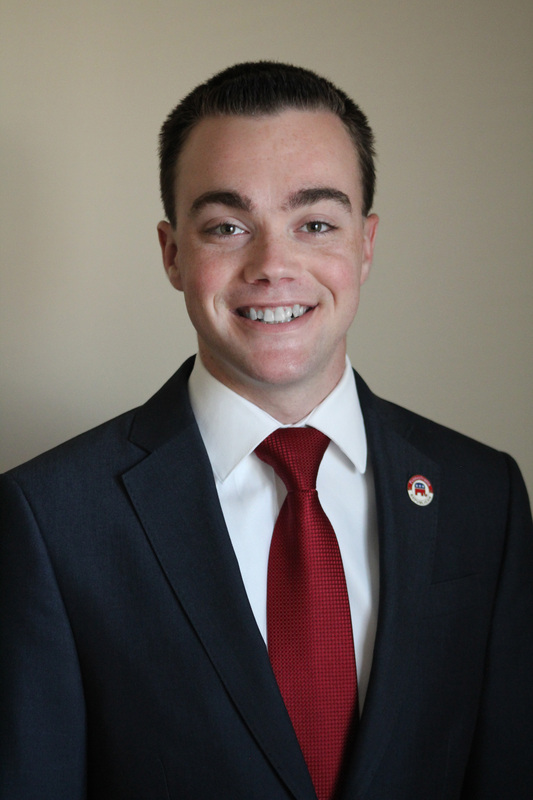 Brandon Ferrance is the chairman of the Pennsylvania Federation of College Republicans, he is also currently serving on the executive committee of the Cumberland County Republican Committee as a vice chairman and the Credentials Committee of the College Republican National Committee. 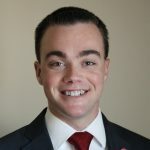 In the past he founded and chaired the Luzerne County Teenage Republicans, served as Northeast Central Caucus representative for the Pennsylvania Teenage Republicans, served as co-chairman, vice chairman, and secretary for the Pennsylvania Federation of College Republicans, as well as working on numerous campaigns across the Commonwealth. He was recently named to PoliticsPA’s 30 Under 30 list as one of Pennsylvania’s 2016 Rising Stars. Raised in Luzerne County, he now resides in Cumberland County and attends school at Shippensburg University where he majors in political science. Former U.S. 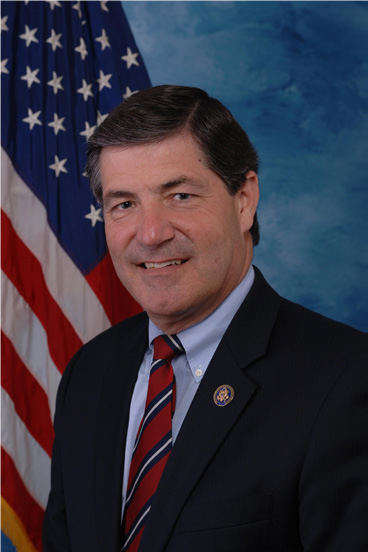 Congressman Jim Gerlach (R-PA) serves as the president and chief executive officer of the Business-Industry Political Action Committee (BIPAC). He joins BIPAC following an extensive career in public service and the private sector. Rep. Gerlach served Pennsylvania’s Sixth Congressional District for 12 years where he most recently served on the House Ways and Means Committee and its Subcommittees on Health and Select Revenue. In the 113th Congress he was also the lead Republican on the Ways and Means Manufacturing Working Group. 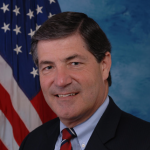 During his six terms in the House, from 2002-2014, Rep. Gerlach also served on the Transportation and Infrastructure Committee, Financial Services Committee, and the Small Business Committee. National publications, including National Journal and Roll Call, have recognized Rep. Gerlach’s strong record as an independent voice. He is no stranger to difficult campaigns. The 6th District was ranked as the most competitive district in the nation between 2002 and 2008, according to a University of Minnesota survey. Prior to his tenure with the U.S. Congress, Rep. Gerlach also served four years in the Pennsylvania House of Representatives and eight years in the Pennsylvania Senate. This public service was preceded by 10 years of private law practice in the Commonwealth. Throughout his career, Jim has always stood for free enterprise. Gerlach was repeatedly named a “Guardian of Small Business” while serving the citizens of Pennsylvania as a state legislator and a Member of the U.S. Congress. While in Congress, he received perfect scores from BIPAC’s Outline for Prosperity, received the U.S. Chamber of Commerce Spirit of Enterprise award, and gained support from the National Federation of Independent Business (NFIB). Active in his community, Gerlach served as a member of the board of directors of the Brandywine Health Foundation, as well as a member of the board of directors of MECA (Mission for Educating Children with Autism), the board of trustees of Dickinson College, the Chester County Agricultural Development Council, the West Brandywine Township Zoning Hearing Board, and the board of directors of the Brandywine Hospital. 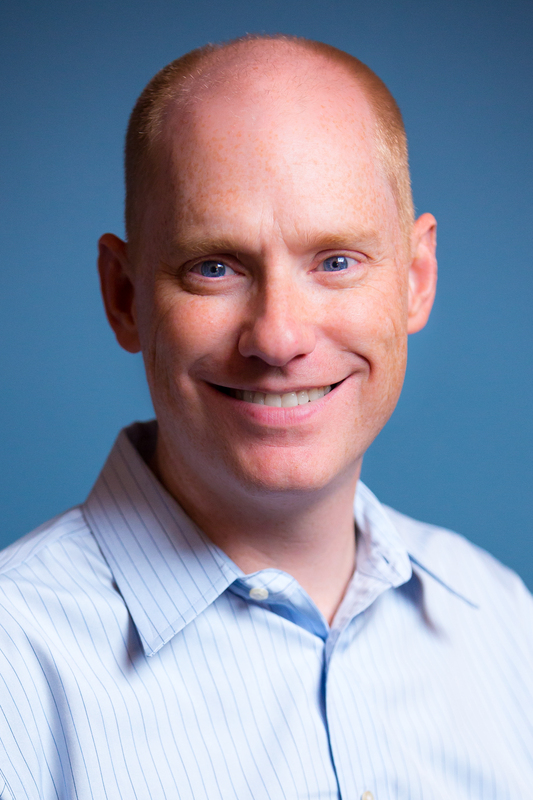 David O’Connell (moderator) is an assistant professor of political science at Dickinson College. 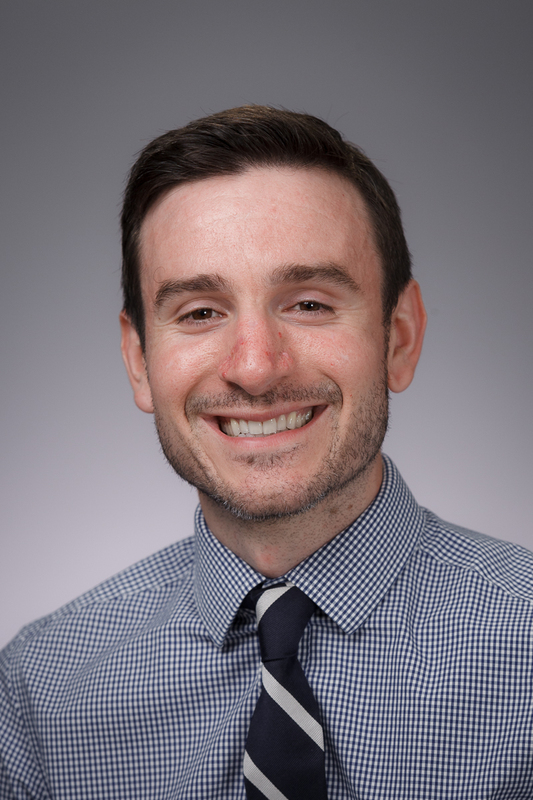 His research interests include the presidency and religion and American politics. O’Connell’s research has been published in Presidential Studies Quarterly, and his first book, God Wills It: Presidents and the Political Use of Religion, was recently re-released in paperback. 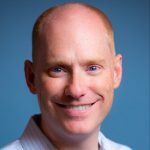 Professor O’Connell is a frequent media commentator on American politics, having appeared on C-SPAN, ABC27, CBS21, FOX43, WGAL 8 and WITF, and he has been interviewed by print outlets ranging from CNN to The Christian Science Monitor to the Associated Press. Professor O’Connell received his M.A., M.Phil., and Ph.D. in political science from Columbia University, and holds a B.A. in political science and economics from the University of Pennsylvania.